40 miles north on the Appalachian Trail past the Maine/New Hampshire border lies the infamous “Mahoosuc Mile”. Nestled in a deep notch between Speck Mountain and Goose Eye Mountain is what many refer to as the most difficult mile on the whole AT. With steep cliffs on either side and what appeared to be no other alternative, trail builders routed the pathway through a mile long boulder field before climbing steeply back into the mountains on both the north and south sides. 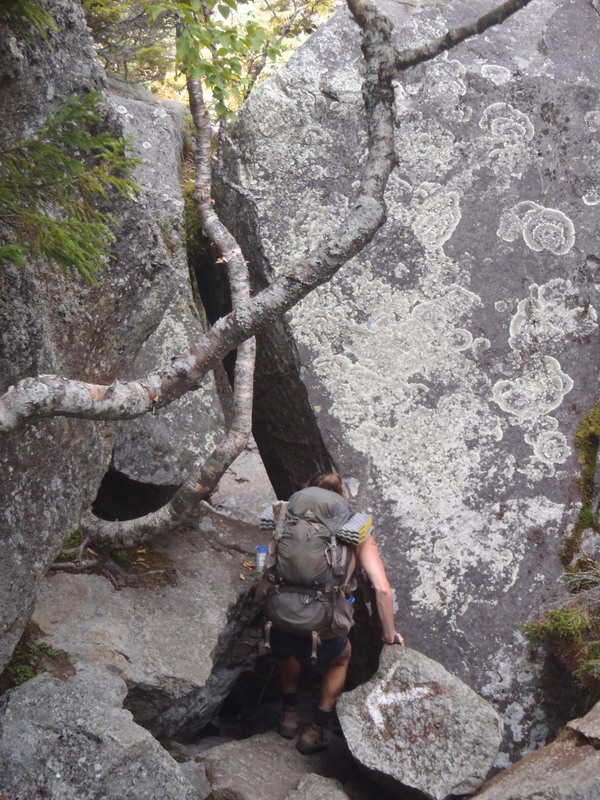 Traversing the Mahoosuc Mile is the epitome of two common themes on the AT; choose your own adventure and that weather makes the difference between a good day and a bad day . One thing is for sure when you get to the end of the Mahoosuc Notch, you either loved it or you hated it and not much in between! 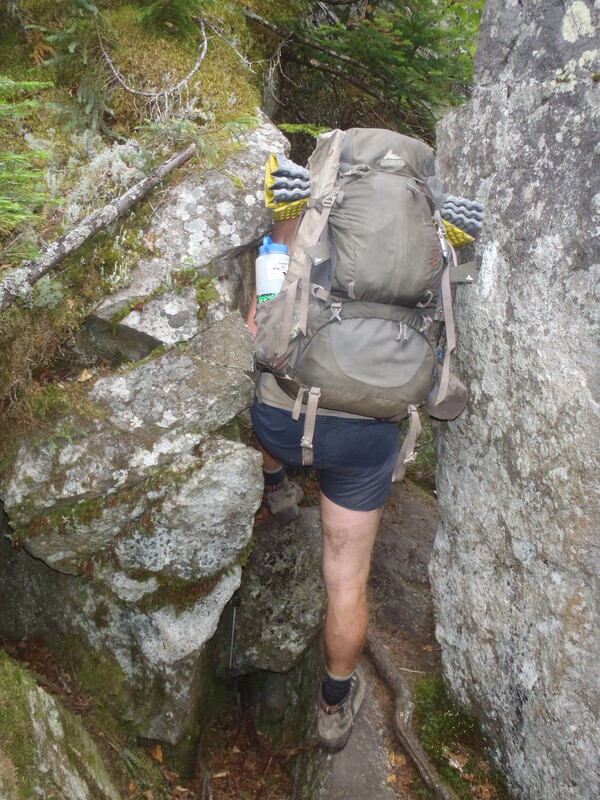 Clay’s turn to “think skinny” and squeeze through some rocks with his pack on. Besides hoping for favorable weather conditions, it also takes a bit of general athleticism to make the 90 minute hike through the notch shade toward the fun side of the spectrum. The notch could be described as a narrow, 20 feet wide at times, path between two steep hillsides that is filled with car sized boulders that seemingly tumbled down from the mountains above and settled in a random pattern where they came to a stop. The jumbled boulder field became a jungle gym for hikers, having elements of a schoolyard playground, complete with tunnels to crawl through, improvised ladders to climb made from rocks and roots and even the occasional swing from an overhanging tree to get across a gap in the boulders! One of the neatest parts of going through the Mahoosuc Notch in early September is finding hidden ice pockets deep in the rock. Regardless of the time of year it is impossible for sunlight to penetrate some of the cavernous spaces hidden deep in the boulders, resulting in pockets of ice cold air that felt like we walked into a refrigerator. Thats right, we had ice in September at just 1,000 feet above sea level! 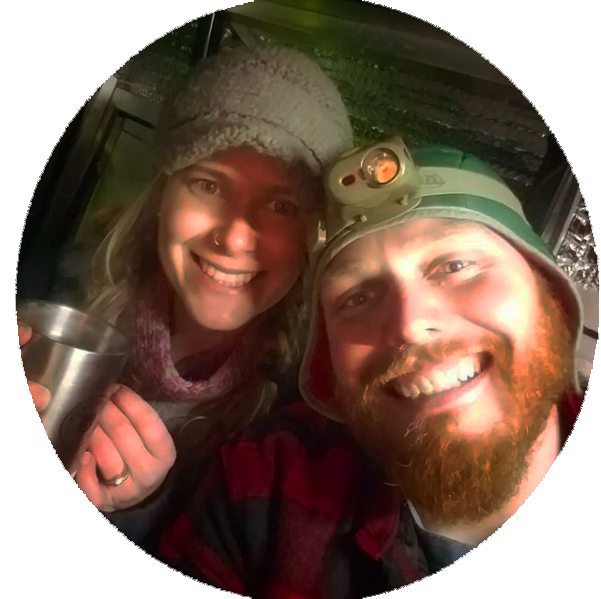 For us, we loved hiking the Mahoosuc Mile. Even though we hit it late in the afternoon after a full day of hard hiking we had a blast playing in the notch. Of course it was slow, I don’t know if there is actually a way to do it in under an hour without a jetpack, but not every day is about how fast you can do every mile. 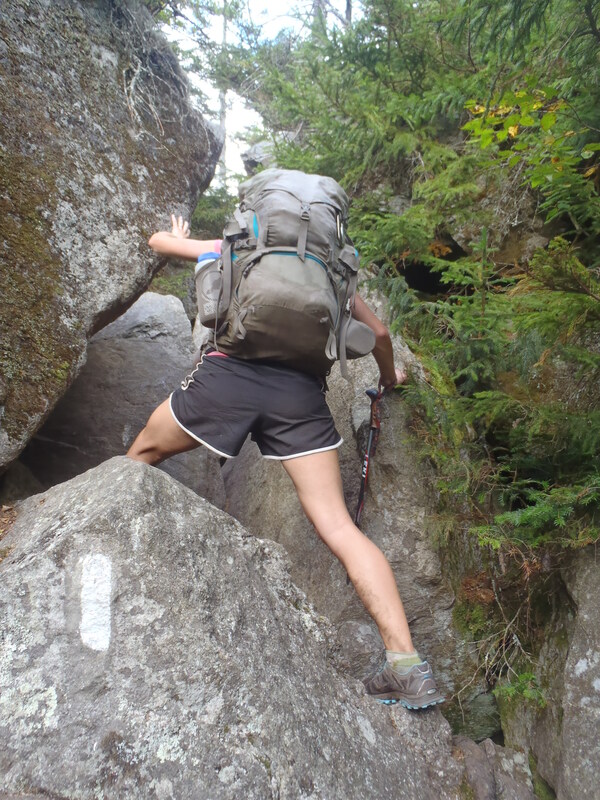 Going through the notch on a sunny, cool fall day broke up the difficult monotony of tackling the Mahoosuc Mountains and gave us some funny videos and great pictures of our rock scrambling, tunnel crawling, ledge jumping hiking adventure!